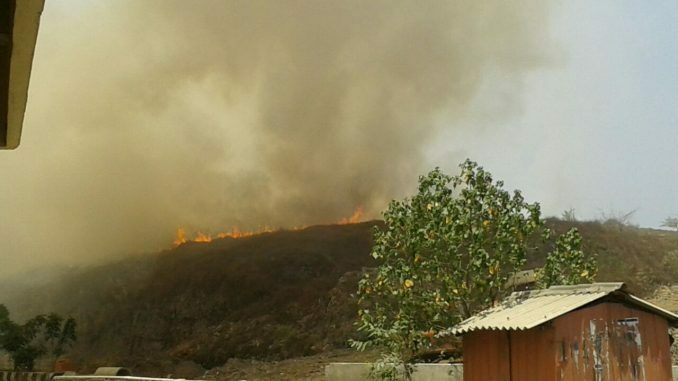 A three-hour-long fire that raged at the landfill at Kodungaiyur on Monday morning was extinguished by firefighters and Chennai Corporation workers. Thick smoke rising from the fire hung over the area for a few more hours, as a reminder of the regular peeve of residents here. The Greater Chennai Corporation (GCC) seemed almost prepared to handle the emergency, since fires are hardly uncommon here. The GCC and the fire department employed 12 Sintex tankers of 2000 litre capacity each and two tankers of 12,000 litre capacity to douse the blaze. “Formation of Methane gas from the landfill would have caused the fire,” said a senior official from the Solid Waste Department of GCC, adding that there is round-the-clock surveillance at the landfill. While the problem has been temporarily taken care of, the question of ‘transferring’ the corporation-maintained landfill from the residential locality, which could be a permanent solution, remains unanswered. Kodungaiyur is a part of the high-profile Radhakrishnan Nagar constituency from which J Jayalalithaa contested. It may now be labelled as the ‘dump-capital’ of Chennai, but long time residents remember it as an ecologically rich and serene locality. Tracing its ecological deterioration, noted environmentalist Nityanand Jayaraman recalls that Kodungaiyur was once part of a large wetland. Fodder grown here was supplied to the government dairy farms, as well as for the animals in (Vandalur) zoo, which then existed in Moore Market. 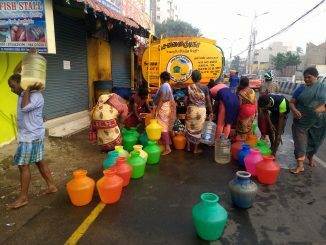 “The destruction started when the Chennai Corporation constructed a sewage treatment plant in the wetland and later, handed it over to the Metro Water department,” says Jayaraman. As most parts of the city lacked an underground drainage system, sewage collected in the septic tanks were discharged at the fodder farm, before the pumping station was constructed in late 1970s. The Corporation started dumping garbage in a small pit at the fodder farm around 1981, after which the farm disappeared. Kodungaiyur residents thus witnessed the replacement of wetlands and waterbodies with a huge dump yard. The process has harshly impacted their health and lifestyle, with lush green spaces making way for mountains of garbage and the air turning toxic. Residents feel that their life expectancy has decreased multifold, for having continuously breathed in these toxins. Residents allege that the corporation officials set fire to the garbage in order to reduce the growing landfill. Every year, at least two fire accidents occur in the Kodungaiyur dump yard, during which locals have to move to other parts of the city to avoid the terrible pollution. “The place becomes unlivable during a fire, as we cannot breathe and almost suffocate in the polluted air,” said Meena Kumari, a resident. The dumpyard is close to Rajaratnam Nagar, a slum development board building, which accommodates evicted people from Royapettah. “Rajaratnam Nagar is also constructed on a waterbody, with funds procured from a World Bank scheme,” added Mr Jayaraman. Residents of Kodungaiyur had filed a petition in 2002 before the Madras High Court seeking to transfer the landfill. While the court had ruled against burning of garbage in 2010, a permanent order is still due. “What stops the High Court Judges from ruling against the illegal landfill? They are biased and insensitive,” said Nityanand Jayaraman. The landfill is also a direct violation of the Municipal Solid Waste (MSW) Rules, 2016, that mandates the civic body to segregate waste and decompose it in a eco-friendly way. At Kodungaiyur, one can find all sorts of waste: Electronic waste, unsegregated household waste, plastic and thermocol sheets, medical waste and the list goes on. Following the complaints about health hazards, Community Environmental Monitoring (CEM), in coordination with Global Alliance for Incinerator Alternatives (GAIA) took air sampling in Kodungaiyur, during a fire in March 2012. The sample was taken at a time when the smoke was intense. According to the report , a total of 19 chemicals including Carbon Disulphide, Carbonyl Sulphide and Propene were detected in the air. “Sixteen out of the 19 chemicals found target the central nervous system, 15 target the respiratory system, 13 target the eyes, 12 target the skin, 6 target the liver, 5 target the kidneys and reproductive system, 2 target the cardiovascular system and the peripheral nervous system and 1 targets blood, heart and bone marrow,” mentioned the report. Despite such alarm bells, plans to move the dump yard from Kodungaiyur has not yet moved into the ‘implementation stage.’ The Greater Chennai Corporation’s proposal to convert the Kodungaiyur landfill into a green hillock also remains only on paper. Will the plastic ban now also extend to packaging such as biscuit covers? How can the city tackle water crisis in the wake of failed monsoons that are growing increasingly common? What’s in the 140-crore project for streetlights? All this and more in this week’s ‘buzz’. 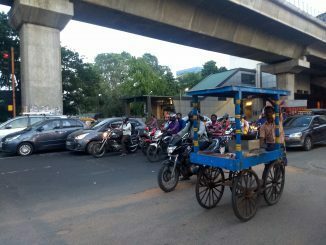 If this is how Chennai’s public parks are, where will our children play? Renovation or beautification of parks finds routine mention in Corporation budgets. 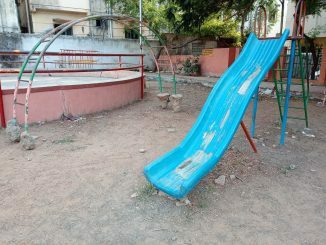 These photos of ill-maintained surroundings and dangerously damaged play equipment however cry out, how were the funds used?